No study of the Gilded Age is complete without a discussion of the magnificent mansions constructed by the super-rich as they attempted to out-shine each other in conspicuous consumption through architectural display. 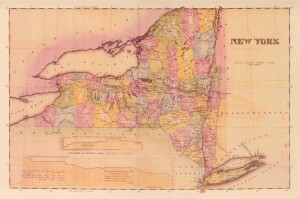 Although most textbooks focus on Newport’s “cottages”, or George Vanderbilt’s Biltmore in North Carolina, New York historians can point to palaces on Fifth Avenue, mansions along the Hudson and the shores of Long Island, or the Great Camps of the Adirondacks. 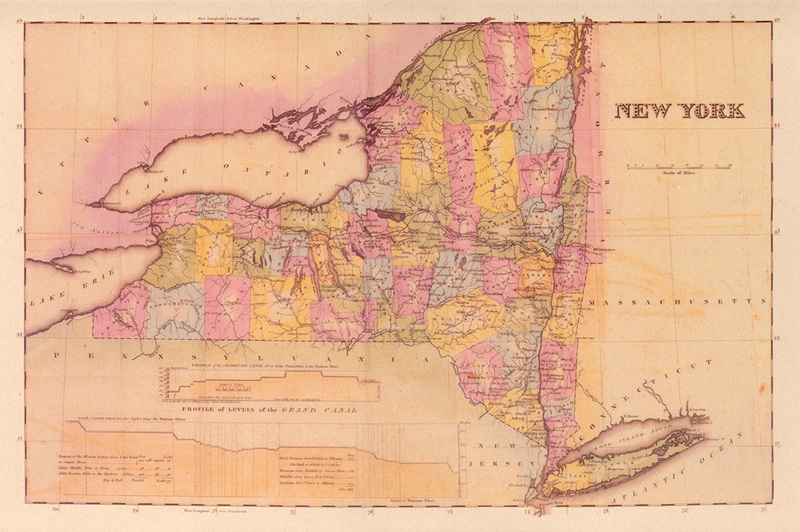 However, New Yorkers also built two remarkable castles at the far Northern border of the state, each located in the Thousand Islands region of the St. Lawrence River: Boldt Castle on Heart Island, near Alexandria Bay, and Singer Castle on Dark Island, near Chippewa Bay. Interestingly, these castles were built almost simultaneously (in the first years of the 20th century), only about 30 miles apart, each by a self-made millionaire. Though the names of George C. Boldt (1851-1916) and Frederick G. Bourne (1851-1919) are no longer familiar, in their own era they were well known as innovative entrepreneurs in their respective fields – hotel management and international business. 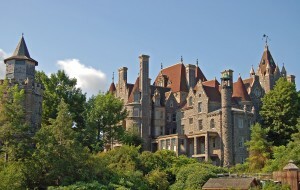 Boldt’s castle was designed to resemble a German fortress on the Rhine, while Bourne’s was based on Scottish castles such as those described in Sir Walter Scott’s novels. 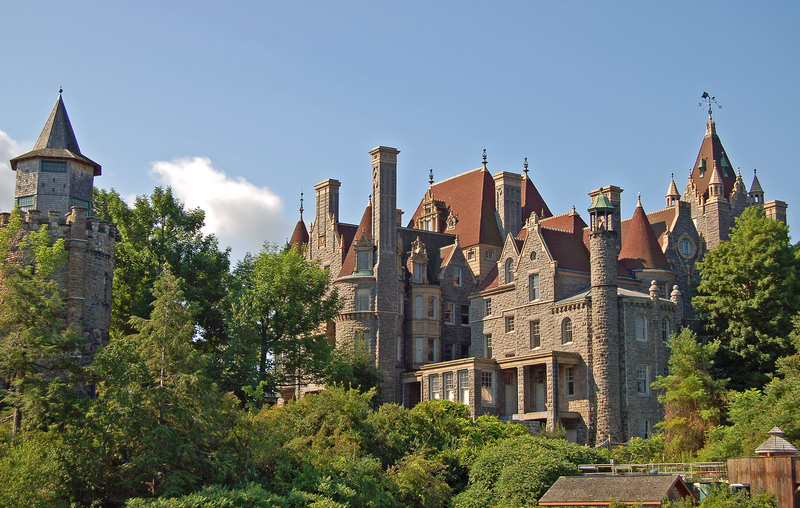 Boldt Castle has the more dramatic story. George Charles Boldt immigrated to the United States from Germany in 1864, and began work as a dishwasher in New York City. His big break came in Philadelphia, where his abilities were recognized by the owner of an exclusive club, who made Boldt the manager of its dining room. Boldt also married the boss’s young daughter, Louise Kehrer (aged 15), who assisted in his later business ventures. After the Boldts established the Bellevue-Stratford as the premiere hotel in Philadelphia, George was tapped by William Waldorf Astor to design, manage, and co-own another grand hotel – the original Waldorf. The major purpose of this mammoth structure was apparently to annoy Astor’s aunt, whose private home was located in the adjoining lot. In the ongoing family feud, William’s cousin, John Jacob Astor IV (yes, the one who died in the sinking of the Titanic), then built the equally luxurious Astoria Hotel next door. It was Boldt who made peace between the cousins and linked the rival hotels, creating the famed Waldorf-Astoria, then located at Fifth Avenue and 34th Street. This entry was posted in North Country on September 26, 2013 by Susan Lewis. The first African American poet published in the United States was not, as I had always learned, Phyllis Wheatley, but an enslaved man of African descent, Jupiter Hammon (1711- before 1806). Hammon was born, lived most of his life, and died on the North Shore of Long Island, then part of Queens, in the village today known as Lloyd Harbor (Town of Huntington). The village is named after his masters’ family, and the Joseph Lloyd Manor House (c. 1766) located on Lloyd Neck is an historic site open to the public – which is how I came across Hammon’s name. 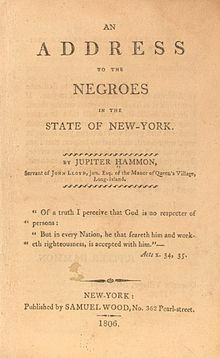 In fact, Jupiter Hammon is not only the first black American poet to be published (in a 1760 broadside), but— according to Dr. Cedric May, an expert on 18th century African American Literature— the first individual of African descent in American history to have his own words published from manuscripts written in his own hand. This entry was posted in Long Island on September 17, 2013 by Susan Lewis.